People come to know the world the way they come to map it—through their perceptions of how its elements are connected and of how they should move among them. This is precisely what the series is attempting by situating the map at the heart of cultural life and revealing its relationship to society, science, and religion…. It is trying to define a new set of relationships between maps and the physical world that involve more than geometric correspondence. It is in essence a new map of human attempts to chart the world. If you head over to this page, then look in the upper left, you will see links to three volumes (available in a free PDF format). My suggestion would be to look at the gallery of color illustrations for each book, links to which you'll find below. The image above, appearing in Vol. 2, dates back to 1534. 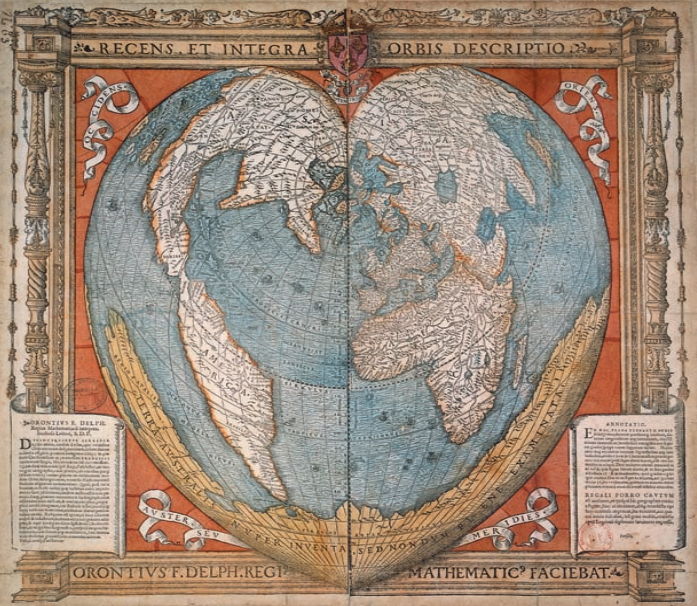 It was created by Oronce Fine, the first chair of mathematics in the Collège Royal (aka the Collège de France), and it features the world mapped in the shape of a heart. Pretty great. Note: If you buy Vol 1. on Amazon, it will run you $248. As beautiful as the book probably is, you'll probably appreciate this free digital offering. The series will be added to our collection, 800 Free eBooks for iPad, Kindle & Other Devices. They’ve made the images lo-res so you can’t see much detail – sad. Why such amount of work with scanning etc. whilst such poor quality of pictures? It’s neither fun nor avail downloading these low-resolution images of the maps. Waste of time, sad! No mention of rock painting cartography which undoubtedly are some of the oldest known maps? No bamboo maps used by Polynesian seafarers? Most ambitious overview ever? I don’t think so. Poor quality images. Very sad.